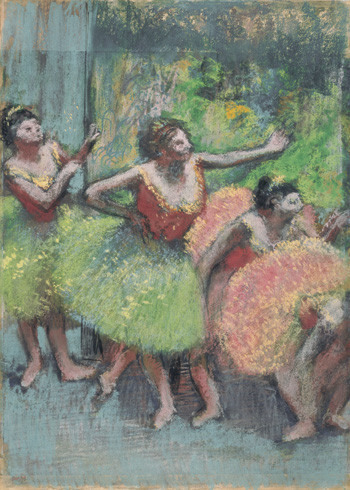 Choreographer Christopher Wheeldon describes what the dancers in the wings are up to in Degas’s Dancers in Green and Yellow on the exhibition audio tour. Well, this is a very familiar, very, very familiar pose to me and has been captured and I was thinking about this the other day. There’s a Royal Ballet poster, from when I was in the company, which means it must have been in the early ’90s, of a very similar composition of ballerinas in the wing, in costumes for I think La Bayadère, watching what’s going on onstage. And often what happens is, I think my story here would be that, one of their fellow corps de ballet members has been given the opportunity to dance their first solo variation on stage and there would be great, there’s always great excitement and a great deal of support amongst the young dancers for their colleagues. So perhaps, you know, perhaps that’s what’s going on here, that they’ve all rushed from their warming up positions on the side of the stage, to take a quick peak to see how she does, some probably with support in mind, and others hoping that she’s going to roll her ankle and mess it all up so that they get the chance themselves. Choreographer Christopher Wheeldon talks about the pose of Degas’s Dancer Moving Forward, Arms Raised on the exhibition audio tour. 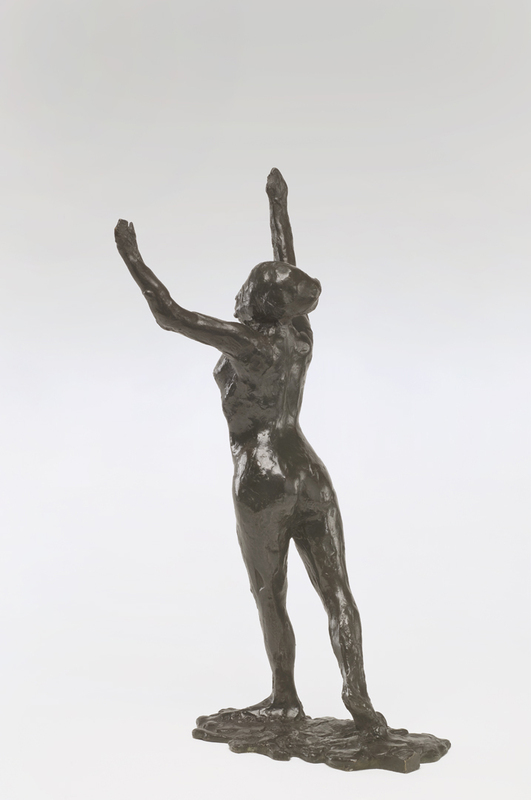 Hilaire-Germain-Edgar Degas, Dancer Moving Forward, Arms Raised, c. 1882–98 (cast c. 1919–31), Bronze, 13 3/4 x 6 7/8 x 6 in. Hirshhorn Museum and Sculpture Garden, Smithsonian Institution, Washington, D.C. Gift of Joseph H. Hirshhorn, 1966. I would say, she must be a modern dancer because it’s not an accurate balletic pose. She’s in demi derrière, her knees aren’t straight, and her arms are relaxed. But it’s very purposeful; it’s very definitely a dance move. You know her weight is over her front leg so there’s no question as to whether this is a pose of relaxation and repose or a dance move. That’s what I would say about that. But again, you know if he was sculpting a ballet dancer, what he’s done is capture the “not quite there moment”. You know this could be a movement that hasn’t yet completed, so the arms haven’t yet achieved the fifth position and the arms, the shoulders haven’t yet come down and the back knee hasn’t straightened. What we also affectionately refer to as New York Times dance photography, which is quite often we’re not there yet, so we, you open the paper and you see yourself in a not quite there position. And for a dancer, it’s just the worst thing, it’s the worst thing. So, but you know, there’s also interest in the movement, so perhaps it’s just something like I said a position that hasn’t yet fully been completed.